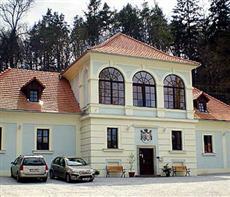 The Pension Vodotrysk Cesky Krumlov is located near the center of the village. This accommodation in Cesky Krumlov offers easy access to the castle. The hotel also offers access to numerous museums throughout the ancient village. The Pension Vodotrysk Cesky Krumlov is situated near the bus and train stations, both of which offer access to the Prague airport located 180 kilometers away from Cesky Krumlov. The city also offers taxis and rental cars, which offer airport access. The city streets are narrow, and most attractions are easiest to reach on foot. Each of the guestrooms at the 200 year old Pension Vodotrysk Cesky Krumlov offers wired Internet access. Guestrooms offer a unique style that is both modern and ancient. All rooms include private bathrooms. Guests of the Pension Vodotrysk Cesky Krumlov will find that there are many restaurants and shops located within walking distance. The hotel offers a children’s playground onsite as well as a terrace that offers views of the forest. The hotel also offers free car parking.